A freestanding Kiosk caters to Costco Club Pickup For Online Orders. A WiFi symbol on front gave me pause, but I assume it indicated the Kiosk was WiFi enabled for placement anywhere in store. Scan your card, look up by name or order number. 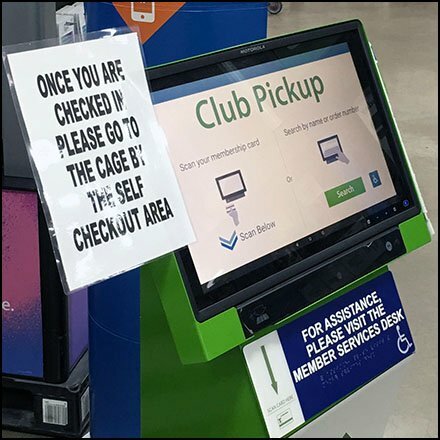 But then you are instructed to “Go To The Cage By The Self Checkout Area.” I assume all online orders ready for pickup are corralled there. Consider all in the Costco Club Pickup For Online Orders gallery of slideshow images.